Comtemporary Fairytale Trailer: Pali Road! Lily, a young doctor, finds love with Neil then awakens from a car accident in a life where she’s married to Neil’s rival, Mitch, and has a son. Everyone denies the existence of the life she remembers. Determined to find the truth, Lily begins to doubt her sanity. 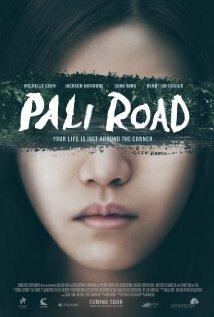 Pali Road Stars Michelle chen, Jackson Rathbone, Sang Kang, and Henry Ian Cusik and will have its world premiere at the 2015 Hawaii International Film Festival. Check out the trailer following the jump. PALI ROAD is a mesmerizing and chilling journey into the mystery of the human psyche and the power of love. Lily (Chen), a young doctor, wakes up from a car accident to discover she is now married to her boyfriend’s affluent rival, Dr. Mitch Kayne (Kang), has a five year old son, and an established life she has no recollection of. Everyone around her, including her parents, deny that her boyfriend, Neil (Rathbone), ever existed, sending her on a desperate search for the truth. Determined to reclaim a life everyone insists is nothing more than an illusion, Lily eventually begins to doubt her own sanity. Struggling to overcome her seemingly hopeless situation, Lily endures a series of unexplainable and haunting incidents while bravely making her way to an ultimate mind bending truth about the power of true love. Previous PostFX’s Tyrant Not Yet Deposed!Next PostPOTUS Does 60 Minutes!